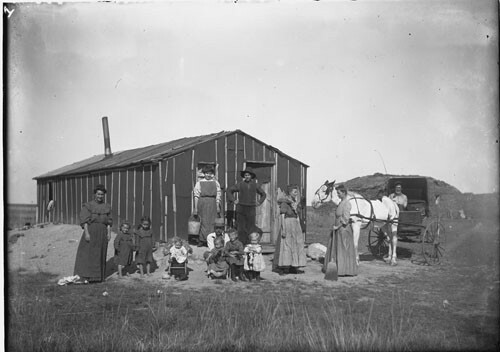 Image of a tar paper shack with people in front of it. There are four women, one is holding a pail, another is holding a broom. There are three men, one is crouched down with a small child, and another in seated in a buggy harnessed to a horse. There are six young children, one is seated in a chair, and three are holding onto puppies. Behind the buggy is a sod building. Shanties were the next standard of living for small-scale farmers in the Red River Valley area. Claim shanties were also a new trend in living structures because they were essentially mobile homes. Because of their mobility, settlers would be able to live for an extended period of time to claim land and move to claim more when they had reached the time limit. Because the railroad reached the settlers on a frequent basic materials such as tar paper, and lumber arrived frequently. These materials were available to the settlers to build claim shanties. This was the beginning of frame shelter building, after sod homes, in the rural Fargo area. Claim shanty farmers continuously populated the area between 1870-1885. Shanties were built directly on dirt ground with no foundation. “Shanty walls consisted of studs, horizontal boxing, and a layer of tarpaper held on with lath.” Shanty shacks were a nicer seeming housing structure but were hardly a match for North Dakota weather. The shanties were difficult to keep warm in the winter and acted as hot boxes in the summer. Tar paper was often used on shanty shacks or as temporary structures of their own. It was a waterproof tar/paper mixture that acted as a shelter sealant for shanty structures of simply temporary tar paper shacks. Once shanty farmers earned enough capital in the area they were about to begin constructing wood frame houses. Dalrymple, John S. “Setting for Dalrymple’s Bonanza”, Oliver Dalrymple and His Bonanza 1984 , p. 129.